Woodfield Mall is located about 15 miles (24 km) northwest of O'Hare International Airport and about 28 miles (45 km) from downtown Chicago. Woodfield Mall is just west of I-290, which is locally referred to as the co-designated name "Illinois Route 53" and connects the west suburbs, and the City of Chicago to the northwest suburbs and Wisconsin via the I-90 interchange, just north of Woodfield Mall. Route 53/I-290 runs north-south alongside the eastern edge of Woodfield Mall with West Frontage Road. Interstate 90, also known as The Jane Addams Tollway (formerly the Northwest Tollway) runs east-west nearby to the north, intersecting I-290/IL 53 northeast of the mall, but tollway traffic must exit southbound at the full interchange of I-290 or to other more distant local road exits to access Woodfield Mall. Pace Bus, the Suburban Bus service, has a complete bus center located just one block south of Woodfield Mall with several routes. The Northwest Transportation Center includes Route 208, Route 696, and Route 895. Daily service from Evanston to Schaumburg. Service operates via Golf Road from Davis Street CTA Purple Line/Metra Station to the Pace Northwest Transportation Center. Service on Sundays has a shorter span of service. Serves the following major destinations: Evanston Township High School, Westfield Shoppingtown Old Orchard, Kraft, Four Flags, Golf Mill, Oakton Community College, Metra UP Northwest Line stations (Golf, Cumberland and Des Plaines), Pace Headquarters, Continental Towers, Meadows Corporate Center, Centennial Center, 3 COM, Hyatt, Woodfield Mall and Streets of Woodfield. Route operates peak period, peak direction, express service (NB in morning; SB in midday and evening) between Chicago Ridge & Pace Northwest Transportation Center with selected trips operating via the CTA Blue Line Rosemont Station. Route also includes a distributor segment to serve businesses in the Schaumburg area; the routing for each morning trip will vary/flex based on passenger destinations and the routing for midday and evening trips will follow the route’s Schaumburg segment, picking up passengers at Posted Stops Only. Route serves Posted Stops Only along the entire route. View Larger Map Nordstrom -- Zoomed in view with in-store level markings. 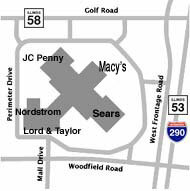 *Bing map may not have all stores updated with the latest Woodfield Mall tenant location.